Around two million years ago glaciers were sculpting the Sangre de Cristo Mountains and left behind a rock dike. As the glacier began to melt, the water found a weak spot in this rock dike and began eroding it. Over the past thousands of years it has carved out what we see today. Zapata Falls is located on US Highway 150, just south of the Great Sand Dunes National Park. The turn off is on the east side of the highway and marked by a sign. It is also in between mile marker 10 and 11. From this turn off it is approximately 3.5 miles to the parking lot and trailhead. It is NOT a 4-wheel drive road so all vehicles should have no trouble in good weather conditions, but the dirt road is very, very rough with washboards. Please use your best judgment if you visit in the winter. The road is usually open all winter unless there is a large amount of snow. The road will dead end at the Zapata Falls Trailhead and then it is a half mile hike to the waterfall. The hike is easy to moderate with some parts being a little steep. There are benches along the way for you to catch your breath and take in the beautiful scenery. 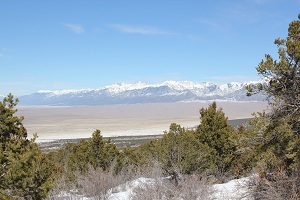 As you hike remember to look out towards the valley and the Great Sand Dunes as the views are magnificent. Once you reach the falls you will have to wade through the water, climb up a little ladder and then walk through a narrow gorge to finally view the waterfall. Definitely plan on getting your feet wet so plan your shoes accordingly. 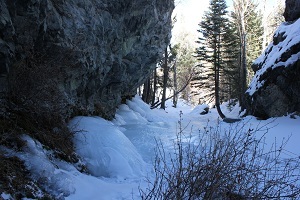 In the winter you walk across the ice to reach the waterfall, but be careful as it is slick and the ice can be thin. 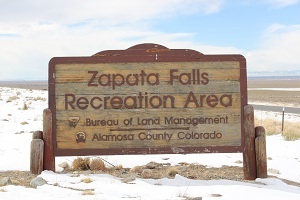 In 2011 a new campground was added to the Zapata Falls area. It is currently free to camp, but donations are appreciated to help maintain the campground. The campground offers 23 single campsites and one group site. All campsites are on a first-come, first-served basis and can't be reserved. There are two one-mile loops that make up the campground. One loop is for tent campers only and the other loop is for campers and RVs. The parking spaces vary in size but most can accommodate vehicles up to 50 feet long. This is rustic camping with a few bonuses such as bathroom facilities, tent pads, and fire rings. Currently there is no running water or trash pick up so bring what you need and pack everything out. Camping at Zapata Falls is sure to be beautiful as you have wonderful views of the San Luis Valley, Great Sand Dunes, and the stars in the night sky! Flowing water is always dangerous. It is advised not to swim in the little ponds below the waterfall, even though they look inviting. Crossing the creek can also be dangerous as the rocks grow a thin layer of moss which can be very slick. As the water for Zapata Falls comes from snowmelt it will be very cold. The creek will also be flowing much faster in the spring when runoff is the highest. 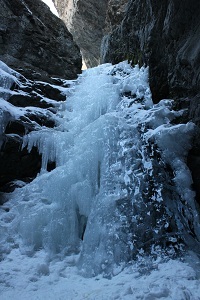 It is usually colder inside the crevice where the falls are so bring a jacket. 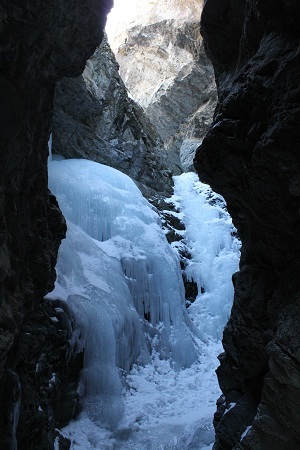 If you visit in the winter you will find the waterfall completely frozen but you can hear and sometimes see the water still flowing behind it and underneath where you walk. Use caution during this time to make sure the ice is thick enough for you to walk across. When you reach the falls you will be rewarded with an amazing ice sculpture that is usually very blue in color. All this may seem really scary and not worth the trip but it is not that bad. I have never heard of anyone being seriously hurt. If you visit in the summer just take your time crossing to ensure you have stable footing. In the winter it is usually frozen solid and the best judge is to see if other tracks have crossed it. When we visited it in the winter you could easily see where the ice was thicker so we stayed on these parts. Remember to use your best judgment and have fun! !